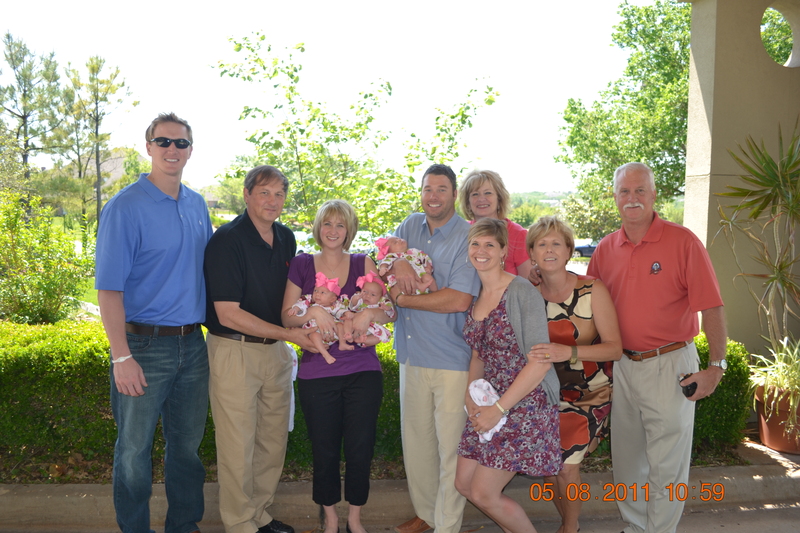 This past month, we celebrate welcoming more multiples into our awesome club! 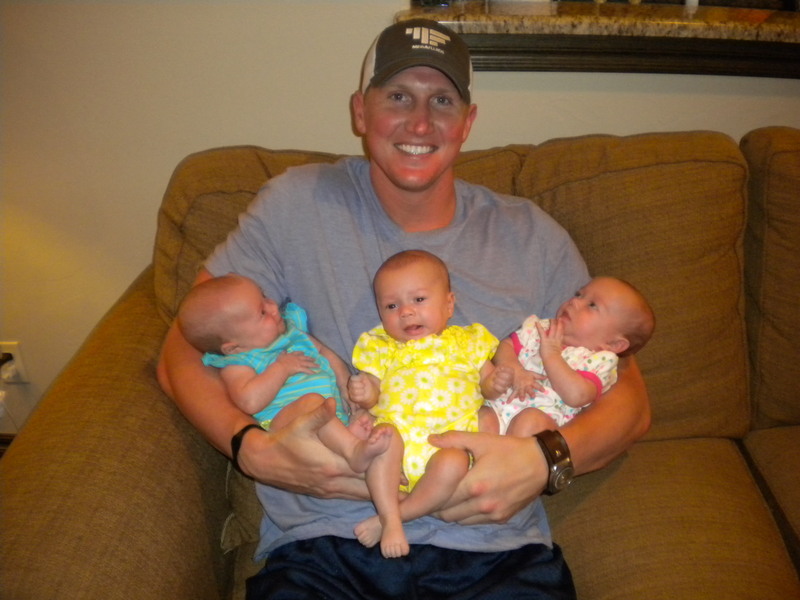 The world welcomed identical twin girls – Harper and Tatum Gaines to parents Zac and Megan. Megan had a similar situation like me and went into premature labor. 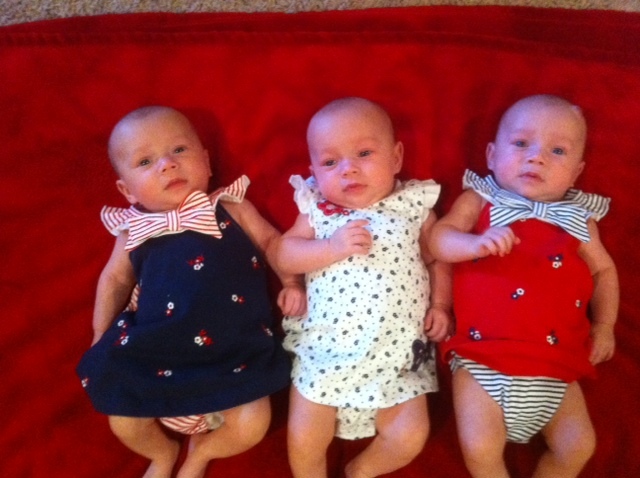 Bryan and I have been praying for these little girls. 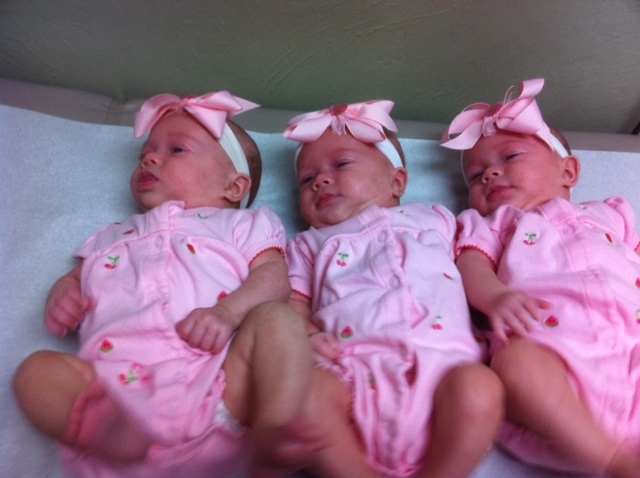 They were born at 31 weeks and they are a little under four pounds each. We know how hard NICU life is and we hope to be able to minister to them during this time. I can tell her girls are fighters like their mom so I know they are perfect in God’s hand and will be home as soon as they can. It has brought wonderful reminders to show us how far we have come since our girls birth in February. God is so good. Another welcome is to Ezra and Zane Gore to parents Kirk and Heidi. They are still in the NICU as well but doing awesome. 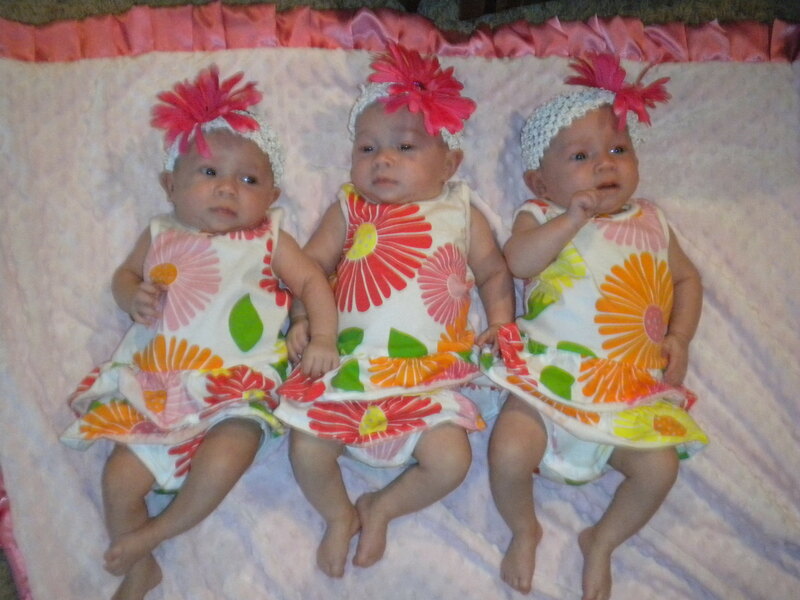 I know they are anxious for them to come home as soon as possible to Mommy and Daddy and big sister Isabella. Many of you are probably wondering what is the water! We have a TON of friends who have had multiples this past year. These precious babies join our friends the Nevels and their twin girls, my friend Erica with twins and another gal from college who just had triplet boys! We have enough children for a basketball team at this point! Or softball! It is a blessing to have a close group of people you know who share your experiences. The girls are 18 weeks this week. Just two weeks shy of five months and the time is flying by! We are slowly getting into a groove and somewhat of a schedule which is refreshing. I am trying not to get attached to it because I have heard that once you get comfortable it changes quickly to something new! I am so proud of these girls. Here are a few first that I am enjoying in just the past two weeks that make this journey a constant reminder of how lucky we are everyday to have triplets. We are still attempting to venture out by ourselves to safe places like Target, Lowe’s, and Hobby Lobby. Places with big aisles and friendly people. I have come to accept that I will have people who stare, gauk, ask questions or whisper. My stroller is a scene in itself. My friend Stephanie even texted me last week and said, “Were you just at Hobby Lobby because the lady in the fabric department said, “We just had triplets in here!” I laughed…Because yes I was there, but also because my friend Stephanie has twins! 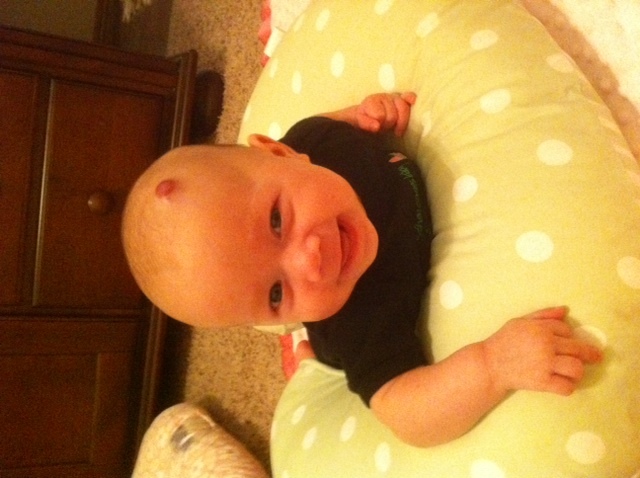 – Emily was the first to roll over this past week! She rolled from her back to her stomach. Does not surprise me. Our little 2 pound miracle has always been eager and anxious from beginning. We always called her our little fighter and she is not proving us wrong yet. She is the most content out of the three. She melts you with her smile. It almost reminds me of a smile when you know someone is up to something. Darling none the less, but I have to keep an eye on her 🙂 I had a mommy cry because I missed her first roll over. I stepped out of the room for two seconds to change my shirt and Bryan witnessed it. He didn’t understand why I was upset but I am with them all day long and the five seconds I am away it happened. But, it was not much longer that I did get to witness it for myself. – Camdyn was the second to roll over this week. She has developed an ear to ear smile that is precious. You can talk to her and hangs onto your every word and the minute you are finished talking she gives you a huge smile! Camdyn and Avery look a lot alike right now. Yes, they all look alike, but Emily and Camdyn are supposed to be the identicals but Cam and Av are showing more similar features. I am sure it will all change next month. – Avery was the last to roll over and I missed that one too. My mother-in-law witnessed that one. 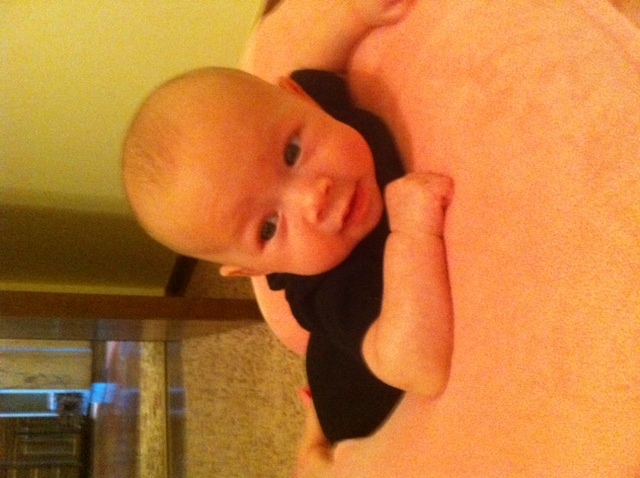 Of coure, the other five seconds I stepped away too….Still have not seen her roll over yet. Avery has been the first to “Cooo” at me and the first to show me a little laugh. Its a good little laugh too! She babbles a little before she laughs and it is so cute. I feel myself grinning so big when she looks at me like that. Those are the biggest firsts lately. They are all sleeping better which is wonderful for Bryan and I. We are very sad to see our miracle, Shawna, leave us tonight. 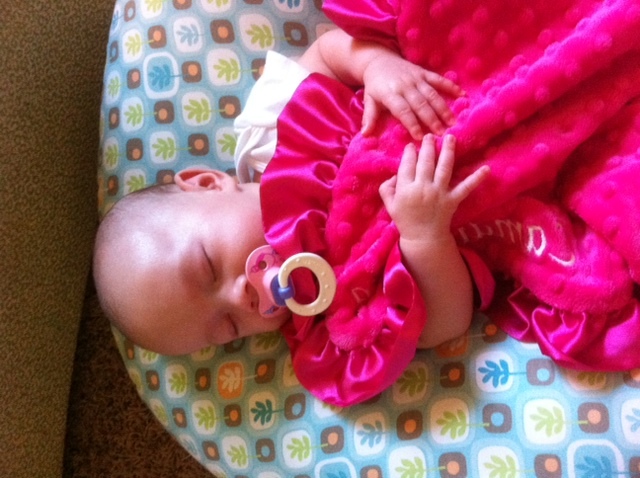 She has been so wonderful for the girls and for Mommy and Daddy the past nine weeks. Like I mentioned before, she is a super mom. She is only 33 and has five children and drives from Minco to help care for my babies. But, she has taught us so many things and really helped us in a time where were the most in need. I am so thankful a mutual friend helped us find her! Tonight, she is here for the last time with her precious six year old who is a little momma helper herself! All in all, life is sweeter and getting easier everyday if you can imagine. This family is a blessing and the journey just continues to enrich our lives. 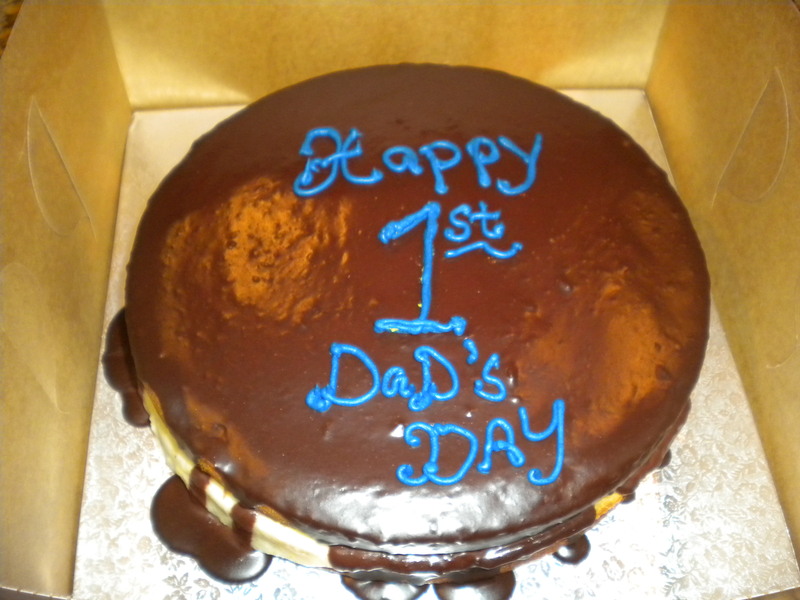 We celebrated Bryan’s first Father’s Day yesterday. I am sure he felt like I did that you cannot believe that you get to be a part of a day that is just for mommys and daddys, its so cool! 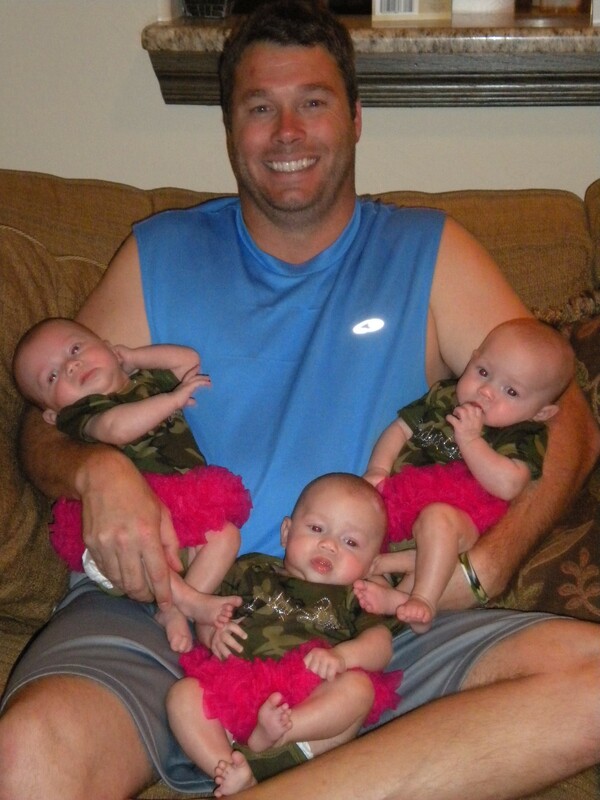 The girls dressed up in their Daddy’s Girl cameo outfits with hot pink tutus. We had dinner with the Coy family and Bryan got a yummy Boston creame cake and some gifts that I did my best to surprise him with. Bryan’s family is from Ohio and he grew up a huge Ohio State fan so we created a little photo shoot in my living room to capture Daddy’s Lil Buckeyes. I had it framed really cute with that saying underneath. He also got a Greg Burns artist rendering of an old wooden oil rig with his company’s name on it and the girl’s name in the sky of the picture. It turned out really neat. Hope you had a great day my love. You are a wonderful daddy! 1. Plan a schedule of help – As much as possible, plan out how you are going to manage multiple children. If you have family, be specific about what your needs are (feeding babies, laundry at your house, running errands). Family wants to feel needed and as much as you do need babies to be fed and rocked the other things are just as important! I started a calendar when the girls came home from the NICU and we had a block of almost every three hours covered – through the night too. If you can afford a night nurse or night help, it is the best investment we have had to date when it comes to expenses! This is the only way we really got sleep these past few weeks. 2. Food – Have a family member or friend set up a care calendar for food. This was such a blessing! We had meals at least four nights a week from friends and family for almost three months. When you don’t have to worry about your meal for the evening it is such a relief and a comfort when the days and nights are so long and tough in the beginning. My sister in law used – www.carecalendar.org. 3. Get out of the house! – Even if its for an hour, make time to get help to your house so you can escape for a brief period of time. Bryan and I were so lucky that we had family that knew it was important for the two of us to take a break and go eat outside of the house or even grab a movie. It will make you better parents when you return home and you may even feel a little refreshed! 5. Free Stuff! – There are resources out there for parents of multiples. I started researching freebies and there are a lot of companies out there that participate in multiple birth program. Again, I always learned in PR that you never know if the answer is no until you actually get one 🙂 You may have to wait until after you have received their birth certificates because a lot of companies require proof. 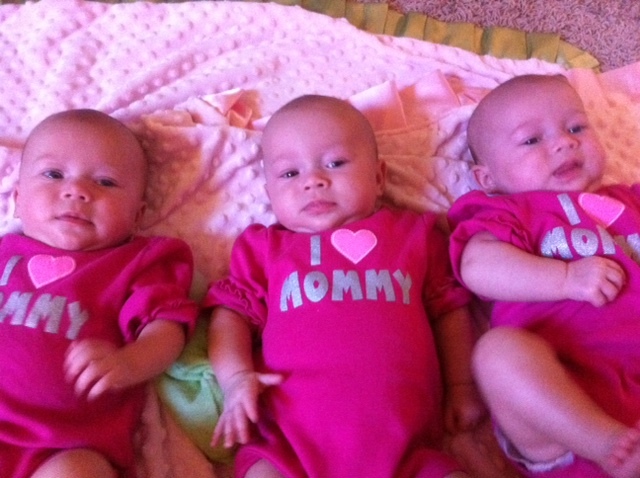 Which is really sad that there are imposters out there who claim to have multiples! Seriously! Here are a few of the resources I have been able to pursue with luck! Look on their website and go under Contact Us and inquire about a multiples program. Let them know you have triplets. They sent me Gerber onsies and coupons for products up to $10 free. They do baby creams and ezsema creams etc. Similac – I sent you the consumer relations number. They will send you a form to select the formula you need and then you send back with their birth certificates. We were so fortunate to receive a case of formula for each baby! This was about $350 in formula and the girls are on a very expensive kind right now. Also, check with your pediatrician. Ours is a rock star and contacted the Similac rep and we got a case of free sample cans as well! Playtex – sent us coupons for money off a diaper genie. But, if you already have one like we do I would not waste your time. (Pampers etc. They sent me a letter and then a multiples program survey to fill out and send back for coupons, samples etc..
1:30 a.m. – Avery wakes hungry. I take personal time to hold her and feed her. The other girls are still asleep but sadly once I am finished with Avery I have to wake them up to eat. If I don’t, we would be feeding babies all hours of the night and day. All three babies eat, get their diapers changed, rocked again back to sleep. 2:48 a.m. – Bryan and I finally get back to bed and attempt to sleep for a few hours. 4:30 a.m. – Avery up again ready to eat. They all alternate this behavior, so its not just Av :). Every is woken up, fed, changed and it takes almost an hour and half from the feeding time to get everyone back to sleep. Two in the swing and one in someone’s arms. 7:30 a.m. – I slept from 6-7:30 a.m. – Woohoo. Got up and made myself coffee, everyone was awake, fed, changed. 9:00 a.m. – The girls are on their boppy loungers watching Ellen with me. I think they like the beginning of the show when she dances! I wonder how we get these girls on her show…Any ideas? haha. 9:45 – 10:00 a.m. – Playtime on the blanket. They are loving this more and more. Their little legs go 90 miles an hour and their arms are like little windmills. 11:00 a.m. – Changed everyone’s diaper, prepared bottles, everyone is starting to cry. That is intense when they are do it at the same time. I just have to take a deep breath and go to a different place so I can stay on task and not be too distracted by it. Everyone eats…AGAIN. We are going about every 2.5 – 3 hours. 11:30 a.m. – I actually get to eat lunch today before 3 p.m. Most days its late afternoon before I realize that I have not had anything to eat. Not healthy I know but as you will notice I don’t have a lot of free time. 11:45 a.m. – Today is bath day. We bath the girls on every third day and we bath everyone on the same day. If not, I would be bathing someone everyday! All girls are in our sitting room with the TV on this time watching Mama Mia. I think they liked the music and dancing. They get that love for musicals from me! One at a time, I take them out of their clothes, undo diapers, make sure the water is ready and bath one baby at a time. I get that one fully sudded up, rinsed and swaddled before they scream because they are cold. Everyone gets diapered, lotioned up and new clothes. Back on boppy, I drain the water and start all over again two more times. 1:30 p.m. – Time to eat again. You know the drill by now. 2:15 p.m. – The girls actually look sleepy. I am working on a nap time. They sleep for about 30 minutes in morning for a “power nap” haha and now between 1:30 – 2:30. I am lucky if they stay asleep for an hour. Everyone gets swaddled. Two in swing, one in my arms and one by one I put them in their cribs. 4:00 p.m. – Holy cow they slept almost two hours!!! I actually had no clue what to do with myself. I took a bath and put the monitor by the tub. That is a first. 4:15 p.m. – Bottles ready, time to eat again. Diapers….etc. 3-5 p.m. – Somewhere around 3-5 I am lucky to have reinforcements come in named Mimi and Nana. They will come and stay about three hours a day and alternate days which is awesome. We could not do this without our families! 5:30 p.m. – I am attempting to make dinner. We have gotten use to eating cold meals because its hard to balance three crying or wanting to be held and eat for yourself at the same time. 9:00 p.m. — They are finally relaxed and calm on their boppy loungers. On Sunday, Monday and Wednesday we are blessed to have Shawna who is a God send. She comes around 9 p.m. and leaves at 6 a.m. so we can sleep. She is wonderful with the girls. What is amazing is that she is our age and has five children (8, 6, 3-year old twins and an 11 month old)! She is superwoman and we have learned a lot from her. 11:00 p.m. – When Shawna is not here, we are rocking and trying to get the girls down and by midnight Bryan and I are trying to go to sleep. If you notice at the top, we start all over around 1:30 a.m.! In three days, we go through a box of 84 diapers, almost two cans of formula ($27 per can right now), average two loads of laundry a day and run the dishwasher at least once, 24 bottles and we try not to forget to feed the dog twice a day! At times, we have to remember to hug each other and say, “How was your day?” I do this all day and Bryan is at work and then clocks in as soon as he walks in the door at 5:30 p.m.
Our schedule is not for everyone and it may seem really ridged for most. But, it takes Type A people like ourselves to survive this journey and feel normal. I am sure when the girls are a little older we can be a little flexible especially when they are sleeping longer! Raising multiples is not for everyone and I don’t know what life would be like without them. They are a lot of work but such an amazing blessing.